A gang of ‘cocky’ drug dealers have been jailed after police found mobile phone photos of them posing with a stash of cannabis and bundles of cash. Almost £1,000 of cannabis, dealer bags and digital scales were seized during a series of raids in the Kings Norton area of Birmingham in February last year. 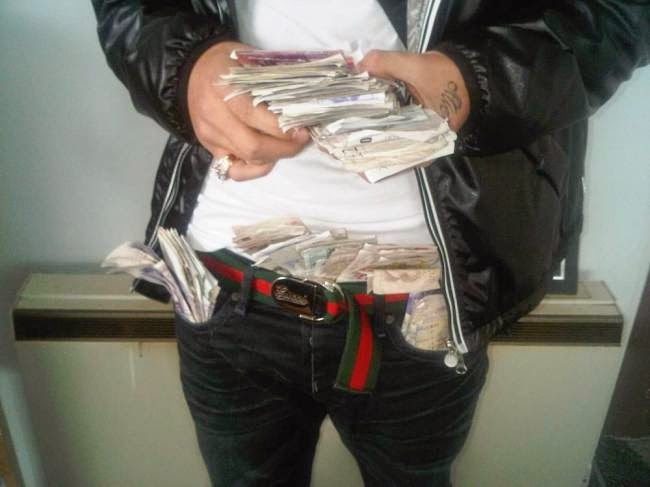 One photo found on a mobile phone showed one of the gang showing off with handfuls of cash and used notes stuffed into his waistband. In another, two of the men can be seen pictured next to dried cannabis leaf scattered across a floor. Eugene May-Dyer, 24, Russell Turner, 18, Ian Cunningham, 24, and Grant Barnhurst, 21, admitted conspiracy to supply Class B drugs at Birmingham crown court this week. These are young men who’d formed a fledgling gang that was on the up,’ said Det Chief Insp Paul Fotheringham of West Midlands Police. Turner was jailed for 13 months and May-Dyer for 12 months. Cunningham and Barnhurst were both handed nine-month sentences.